As the Easter season continues, Broadmeadow will be focusing on surprising acts of God in the book of Acts. We all know he excitement & disquiet that come with the sudden reversal of our expectations. The early Christians whose stories are told in the book of Acts have no shortage of surprises. The resurrection sets off a host of unexpected events and changes for Jesus' followers, even changes within themselves. If our own spiritual lives have come to seem humdrum & everyday, these stories will awaken in us a new desire for God's work int eh lives of unsuspecting, ordinary people like ourselves. 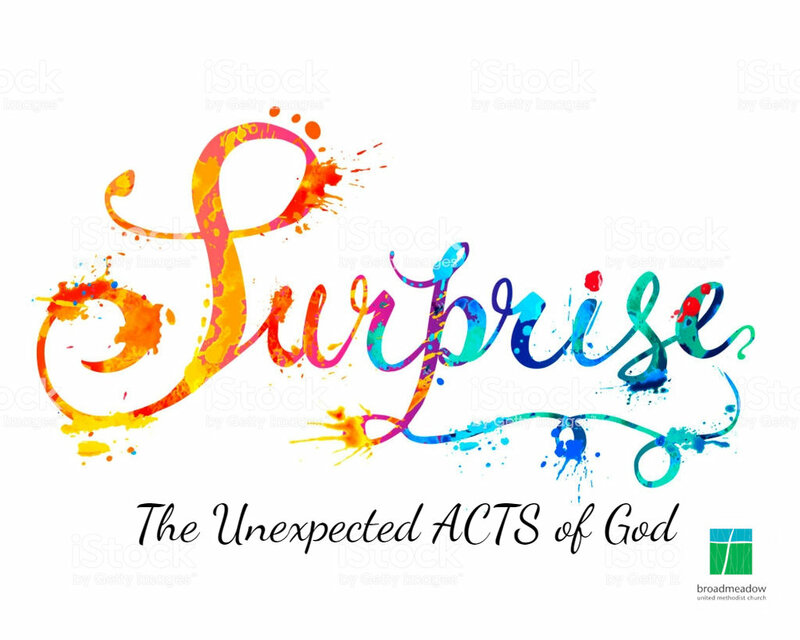 As we explore the journey of surprises in these texts, we will learn the spiritual habit of welcoming an unpredictable God and coming to expect the unexpected. You're invited to join us for our Easter season sermon series: "Surprise! The Unexpected ACTS of God. As we begin 2019, we focus on the audacity of the gospel. From the beginning, the light of Christ reached the outsiders, the forgotten, and the abandoned. Christ's message of God's love for ALL people continues today. You're invited to join us for our "A Light to the Nations" Epiphany sermon series. November is usually the time of year when Broadmeadow emphasizes stewardship. This year is no different. I'm aware, as always, that stewardship is not the topic that gets most of you super excited. But, I want our focus to be a little different this year. We're going to hone in on what it means to give in love. "Love" is an overused word. And its overuse leads to its watering down. But, when Scripture talks about love, it's not just talking about a nice feeling toward someone or something. To love someone means to take drastic action to do good for them. It means living sacrificially so that your neighbors, strangers, and even your enemies have what they need to live abundantly. It means forming communities that work for the betterment of everyone. 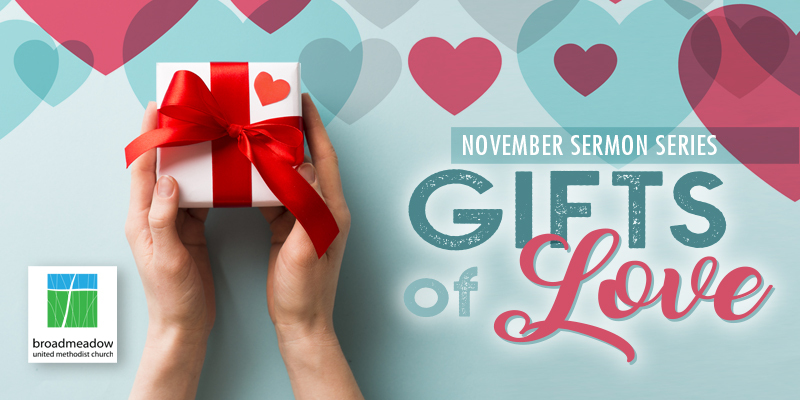 So, all this month, we'll be talking about Gifts of Love. And, yes, I hope by the end you'll make a commitment to support Broadmeadow through the coming year, not just with your money, but with your actions, faithfulness, and love. We'll be starting a new sermon series this Sunday. This walk through the letter to the Ephesians teaches the church how to be a community worthy of the gospel. In the midst of familial interpersonal conflicts, the author of Ephesians reminds them that they are "now in Christ Jesus," no longer strangers to God and, importantly, no longer alienated from each other. Because of this new life in Christ they are experiencing a radical transformation of their identity - as individuals and as a community. These six weeks will explore what it looks like to live rooted in reconciliation, with God and with neighbor and how we practice this reconciliation in radical ways. You're invited to join us for "No Longer Strangers."